Playing games is an important part of many world cultures including India. Children play naturally and devise games of their own. Adult games have been devised using creative skills and artistic expression. The word ”ganj” means treasure or treasury which went on to refer to granary in Persian. The term represents playing cards and card games in India, Nepal, Iran, Turkey and few Arabian countries. Card playing was and still is popular in India and many other countries. Ganjifa cards were circular or rectangular, and traditionally hand-painted by artisans. The earliest references are to the Mamluk cards from Egypt, first mentioned in Annals of Egypt and Syria by Yousuf ibn-Taghribirdi, an Egyptian historian born into the Turkish Mamluk elite of Cairo in the 15th century. The Topkapi Museum in Istanbul, Turkey has a set of Mamluk playing cards datable to 1500s. The set consists of four suits of 13 cards each; cups,swords, coins and polo sticks including one Malik or king, a Naib and Thani Naib – Governor and Vice- Governor. These actually depict the officers at the court of a Mamluk Sultan or Amir; the cup-bearer, the commander of the palace guard, the exchequer and the polo-master or jukandar. Mamluk, Italian, Persian and Indian cards might have a common origin; the exact source is not clear. it might have originated in the West or the East. The pack of cards is sometimes believed to have its origins in the four sided chaturanga, a dice game and a precursor of chess. King Shah Abbas II of Persia had banned the game (1642-67). Mamluk playing cards or kanjifah, from left to right: 6 of coins, 10 of polo sticks, 3 of cups and 7 of swords, 16th century. The earliest playing cards known in India were most probably introduced by early Muslim rulers. The game became popular at the Mughal court during the 16th and 17th century, and lavish sets were made, from materials such as precious stone-inlaid ivory or tortoise shell ; darbar-kalam, by court artists. The game later spread to the general public, and less expensive sets; bazaar-kalam by other artists would be made from materials such as wood, palm leaf, stiffened cloth or pasteboard. In the royal palace of Sawantwadi, skilled craftsmen hand painting Ganjifa cards, Maharashtra, maybe early 20th century. Mughal Ganjifa was similar to the Safavid game in terms of suits and ranks. In the 17th century ”Dashavatara” ganjifa was created to appeal to the Hindu populace. The main development of the game of Ganjjfa happened in India. The Indian cards depict variety and the number of suits can vary from 8 to 10, 12 or 20. Ganjifa cards have coloured backgrounds, with each suit having a different colour. The compositions on many Ganjifa cards resemble small miniature paintings. Different types are found, the designs, number of suits, and physical size of the cards can vary considerably. With the exception of Mamluk kanjifah and the Chads of Mysore, each suit contains ten pip cards and two court cards, the king and the vizier or minister. The backs of the cards are typically a uniform colour, without patterning. Card players expect a constancy in design in packs. The Rajasthani cards show a Mughal influence, Mysore and Cuddapah depict Nayak styles and the cards from Odisha have folk patterns. It is called dashabatar taas in Bishnupur, West Bengal. The painters of the cards are called chitrakars. A king handing a ”Royal Document” to his minister, King of the Barat or Document suit, playing card from a Mughal Ganjifa set, Rajasthan, India, LACMA, U S A,19th century. Playing cards are put in painted boxes which are made of light wood and have different subjects painted on them ranging from flowers, women, mythological themes and animal figures. However, slowly by the end of the 20th century printed cards became popular. The modern printed packs made the older hand painted cards obsolete and so also the games associated with them. Ganjifa box with ornate designs, 19th century. Image source : Michael BackmanLtd, U.K.
Five galloping elephants, Number six of the Gajpati or Lord of Elephants suit, playing card from a Mughal Ganjifa Set, Rajasthan, India, 19th century, LACMA, U S A.
Lord Krishna preparing to decapitate King Kamsa, King of the Krishna suit, playing card from a Dashavatara ganjifa set, Sawantwadi, Maharashtra, mid-18th century, LACMA, U S A.
Enthroned and crowned Buddha holding Lotuses, King of the Buddha suit, playing card from a Dashavatara ganjifa set, Rajasthan, India, 19th century, LACMA, U S A. There are many variants of Ganjifa. The Mughal Ganjifa, the Dashavatara Ganjifa, the Ramayan Ganjifa, the Rashi Ganjifa, The ashtamalla Ganjifa, the Naqsh Ganjifa, the Mysore Chad Ganjifa. Ahli Shirazi wrote Rubaiyat-e-ganjifa’ for each of the 96 cards in a eight suit pack. The game is mentioned in Ain-i- Akbari, the record of Emperor Akbar’s reign. In fact there was a variety of Ganjifa called Akbar’s Ganjifa. Mughal ganjifa playing cards, early 19th century, Wovensouls Textiles and Arts Gallery. Playing cards made with the traditional pattachitra technique from Puri, Odisha, India. A king in an elephant-drawn carriage, King of the Ghulam or Slave or Servant suit, playing card from a Mughal ganjifa set, 19th century, LACMA, U S A. A woman with Seven Documents, number seven of the Barat or Document suit, playing card from a Mughal ganjifa set, Rajasthan, 19th century, LACMA, U S A. This entry was posted in art history, art history of India, asian art, Dasavatara, Ganjifa, Miniature paintings and tagged art history of India, Ganjifa, Mughal miniatures, Playingcards on April 16, 2019 by historyreads. Dasavatara refers to the manifestations of Lord Vishnu. The avatars are different forms of a single divine force. He is a part of the Hindu trinity of Brahma, Vishnu and Shiva. He is the God of Preservation.Lord Vishnu incarnates on Earth from time to time to eradicate evil forces, to restore dharma and liberate his worthy devotees from the cycle of births and death. He is a saviour and brings balance to the earth. His ten avatars are Matsya, Kurma, Varaha, Narasimha, Vamana, Parashurama, Rama, Krishna, Buddha and Kalki. Matsya avatar : This is the first avatar of Vishnu; the great fish from Satyuga. He saves Manu and all other creatures of the earth from deluge in the form of a half human,half-fish. There is another version which says he takes the matsya form to save the Vedas sacred texts of the Hindus from the demon Hayagriva and also saves the seven sages or saptarishi. Kurma avatar : Kurma means turtle in Sanskrit, also the second avatar of Vishnu. This incarnation is also from Satyuga. Vishnu as Kurma supported Mount Mandara from sinking during the churning of the vast ocean of milk or samudramanthana for the pot of nectar for the devas to drink, as they had lost their strength due to a curse by Sage Durvasa.The devas had lost their strength an the asuras overpowered them; Lord Vishnu stepped in to help The serpent Vasuki served as the churning rope. Vishnu had to take the form of a turtle during the churning as the Mount had started to sink. The devas and asuras both churned the ocean in order to have the nectar. Fourteen precious items rose from the ocean; Dhanwantari, the God of ayurveda brought with him the nectar. The asuras immediately got hold of the nectar. Lord Vishnu took the form of Mohini, a beautiful woman and distracted the asuras and the devas could get the nectar to themselves. On drinking it they became strong and could defeat the asuras. Vishnu and his avatars, black schist,11th century,Brooklyn Museum,USA. Varaha avatar : Lord Vishnu appeared as a boar to defeat Hiranyaksha , a demon who had taken the Earth,Prithvi or Bhu and carried it to the bottom of what is described as the cosmic ocean. The battle between Varaha and Hiranyaksha is believed to have lasted for a thousand years, which was won by Varaha. Varaha carried the Earth out of the ocean and restored it to its place in the universe. Narasimha avatar : Hiranyakashipu, the elder brother of Hiranyaksha, a demon or rakshasa was granted a powerful boon from Lord Brahma, by which he becomes invincible that is he cannot be killed by anyone, human or animal, at any time like day or night, or any place either inside or outside. Lord Vishnu take the form of Narasimha, half-lion, half-bird and kills him at the threshold of his house at dusk holding him on his thighs. The Narasimha avatar is also from Satyuga. Dasavatara,Shri Vidyashankara Temple,8th century, Shringeri,Karnataka. Vamana avatar : Lord Vishnu takes the form of a dwarf, during Treta Yuga. Another demon,the fourth descendant of Hiranyakashyapa, Bali, defeats Indra, the Lord of the heavens. Bali takes over all the three worlds.The gods appealed to Lord Vishnu for protection Lord Vishnu takes the form of a dwarf . Vamana during a is ayagna is promised by Bali for three paces of land. Bali agrees and the dwarf then changes his size to that of a giant. He steps over heaven in his first stride, and the netherworld with the second. Bali realizes that Vamana is Lord Vishnu himself. He offers his head for him to place his third step. Vamana does so and grants Bali immortality an makes him the Lord of Patala, the netherworld. Parasurama : This avatar is a warrior with an axe, a brahmin-kshatriya from the Treta Yuga. He has received this axe from Shiva after along penance. He is the son of Jamadagni and Renuka. Once King Kartavirya visits the father of Parasurama at his ashram, and the saint was able to feed them with the divine cow Kamadhenu. The king wants the cow, but Jamadagni refused. The king takes it and destroys the ashram. Parashurama is very angry and kills the king at his palace and destroys his army. In revenge, the sons of Kartavirya kill Jamadagni. Parashurama takes a vow to kill every Kshatriya on earth twenty-one times over, and fill five lakes with their blood. Ultimately, his grandfather, Sage Rucheeka, halts him. Rama : An avatar of Lord Vishnu from Treta yugaHe is widely worshipped and is the ideal man.His story is His story is told in the great Hindu epic Ramayana. While in exile with his brother Lakshmana his wife Sita is abducted by the demon king of Lanka, Ravana. He travels to Lanka, along with Hanuman, a monkey or vanara army and kills Ravana; liberates Sita and goes back to his kingdom Ayodhya to be coronated. 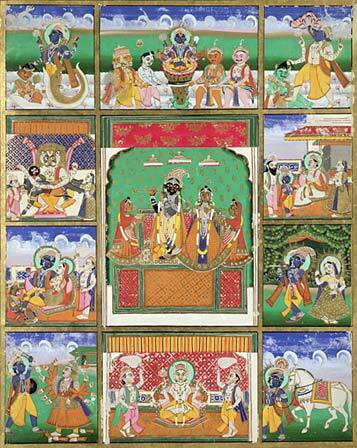 Dasavatara,paining, Jaipur,19th century, V and A Museum, U.K.
Krishna : Lord Vishnu is Krishna in the Dwapara-yuga. He is a popular deity in Hinduism. He is lovable as a cowherd companion of Radha at Vrindavan, the eighth son of Vasudeva and Devaki, and brought up by Yashoda.He has an important role as Arjuna’s charioteer in the Hindu epic Mahabharata and sermonises him as told in the Bhagavdagita. Buddha: Gautama Buddha, the founder of Buddhism, from the Kali-yuga, is generally included as an avatar of Vishnu in Hinduism. Kalki avatar : will be the final incarnation of Lord Vishnu, will appear at the end of Kali Yuga, our present epoch. He will come on a white horse and his sword will be drawn, blazing like a comet. He will destroy all evil at the end of this age. Dasavatara,temple door, Sree Balaji Temple, Goa. Dasavatara,ivory carving,late 18th Century, south India, National Museum, New Delhi. Vishnu : Hinduism’s blue skinned saviour/Cummins,Joan,ed.,Ahmedabad : Mapin Publishing,2011. 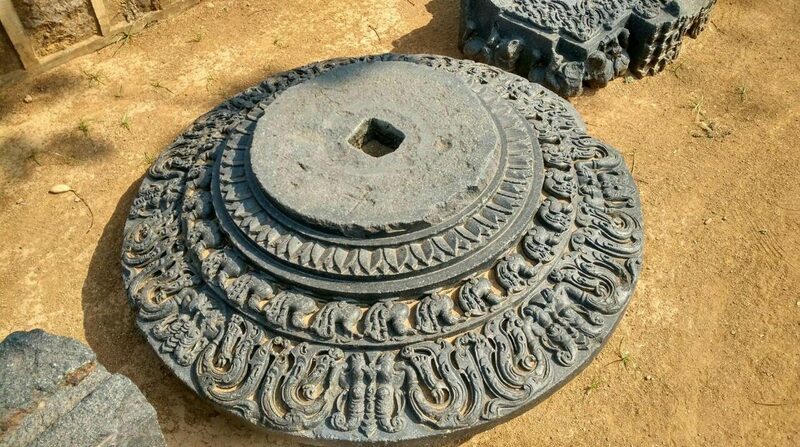 This entry was posted in Ancient Indian history, art history, Dasavatara and tagged Ancient Indian history, art history of India, Dasavatara on February 8, 2017 by historyreads.